If you've been keeping shrimp for a while you might have come across it at some point: cholla wood. It's all the rage in the shrimp hobby right now, but what is it? What are the benefits, and should you be using it in your own tank? Keep reading for everything you need to know about cholla wood and using cholla wood in shrimp aquariums! Cholla wood is a type of wood usually sold in pieces of around 4-6". It doesn't come from trees but is actually a product of the cholla cactus. When these cacti die and dry out, cholla wood remains. Although cholla wood is definitely a visually interesting addition to the aquarium, most aquarists don't use its for its decorative value. It's added to the aquarium because shrimp love it! Unlike most types of wood that are used in the aquarium, cholla is soft and breaks down over time. During this process all kinds of beneficial processes happen. As with Indian almond leaves and alder cones, tannins are released into the water. This can stain the water a slight yellow color, which some consider unsightly but actually helps imitate the natural habitat of many shrimp species. Most importantly, though, tannins have antibacterial and antifungal properties which help protect your shrimp against disease. As cholla wood breaks down a layer of biofilm forms on it. This makes it the perfect place for shrimp to forage; a piece of cholla wood will likely have a few shrimp on it at any given time. Lastly, because cholla is hollow and holey it makes a great hiding place for shrimp, which means you can use it as a natural looking alternative to ceramic shrimp flats. Shrimp will especially appreciate it while molting, when they're very vulnerable and like to be able to retreat to a safe place. Cholla wood isn't difficult to use in your shrimp tank at all. Just buy your cholla wood pieces and, if you're not happy with the size, saw them into smaller bits. This should be an easy task as the wood is quite soft and not too difficult to cut through. Like other wood types cholla doesn't immediately sink when placed into the aquarium; the waterlogging process can take a few days. If you don't want to look at a piece of wood floating around your aquarium during this time be sure to waterlog your cholla before placing it in the tank. This can be done by just putting it in a bucket of water until it sinks. Some sources also recommend boiling cholla wood to sterilize and waterlog it, but keep in mind that this does cause the wood to break down much quicker. Once you've placed the cholla wood in your shrimp tank you can just leave it there until it's fully gone (which can take multiple years with large pieces). As with other leaf litter the decaying process is not harmful to your livestock. Note: If you live in an area where cholla cacti naturally grow you might be able to collect your own cholla wood. Look for pieces that are already dead and dried out: you really don't want to come near live cholla spines and the drying process takes extremely long anyway. If you're not lucky enough to have cholla cacti growing nearby there are plenty of places where you can buy it for a relatively cheap price. 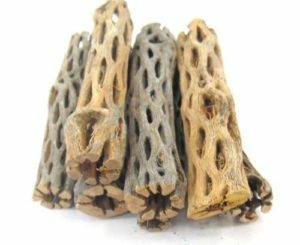 The Shrimp Farm sells cholla wood in 4-6" pieces which you can order here.